There was a time when legal teams had some wiggle room with budgets — their costs to some extent could vary with the issues that arose. But that’s not the modern reality. Budgeting isn’t just a way to justify spending and protect your Legal Department from cuts; it can offer valuable insights that help with strategic and tactical decisions. Xakia’s Legal Operations Health Check has been collecting data to understand how Legal Departments fare in getting a handle on their budgets. In-house counsel on five continents have taken Xakia’s online assessment; most striking was the proportion of teams with financial blind spots that leave them vulnerable. When asked if they could access a "clear, updated picture of their legal spend when needed", only 40 percent of respondents said they did this at least moderately well. That means nearly 60 percent did not. Separating those responses by team size, the largest Legal Departments — those with 50 or more people — came out best, with two-thirds rating their performance at least moderately well. Yet that still leaves a full third of the largest legal teams lacking. 17 percent of all respondents said they don’t have it but see its value. 6 percent are exploring options for adoption. 19 percent are in phases of development. 7 percent have it but it doesn’t meet their needs. 7 percent have it but don’t use it well. 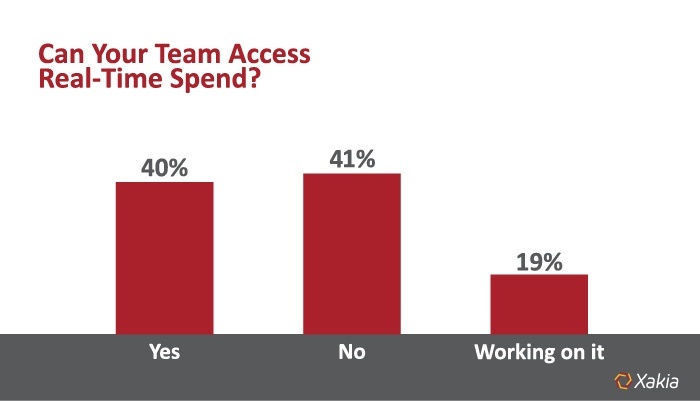 Four percent of respondents said they don’t have it and haven’t considered it or don’t think they need it; all of those represented teams of five or fewer. Similarly, when asked about the breakdown of legal spend - by internal and external costs or by business division and work type - only a third of respondents said they did at least moderately well at understanding their budget. Responses overall tended to skew to one extreme or the other in terms of implementation — Departments indicated either very preliminary interest/early development, or that they already were using such a tool at least moderately well. 46 percent have an annual internal budget that reflects realistic staff levels for business-as-usual activities, one-off projects, travel, training and development, and recognition programs. 46 percent set and monitor a budget for each individual engagement with external legal service providers. 52 percent have a clearly defined annual budget for external spend. 55 percent track their total budget (internal and external) at least quarterly. 58 percent act to understand the root cause of any annual budget overrun and, if possible, rectify it the same year. Except for the smallest group, budgetary progress tended to be similar regardless of size — but there were a few outliers. Billing guidelines: Perhaps not surprisingly, the largest teams (50+) were much more likely to document and enforce billing guidelines, with two-thirds responding that they do it at least moderately well. Responses varied widely for the other sizes of teams, with only 32 percent of all respondents saying they document and enforce billing guidelines at least moderately well. More than 17 percent of all respondents said they either don’t need to or haven’t considered it. External budget breakdown: Oddly, a third of the largest teams don’t have annual budgets that sort spending breakdown between service provider types such as law firms and alternative service providers or technology… not far off from the smallest teams. Those in the middle fared slightly better, with 61.9 percent saying they could perform this type of sort at least “moderately well”; 14.3 percent of midsize teams gave themselves the highest possible rating on this question, saying they both track these categories and continuously improve upon their methodology – more than any other size department. Curious about how your Legal Department would measure up? Take the Legal Operations Health Check, an online assessment that incorporates the Corporate Legal Operations Consortium’s 12 core competencies, the Association of Corporate Counsel’s Legal Operations Maturity Model and Xakia’s experience working with in-house Legal Departments.